We were up reasonably early and we both wandered off for our showers. The morning was freezing and everybody even the rally blokes had their beanies pulled tight down over their ears. They were standing around their brightly painted cars sipping from steaming hot coffee mugs instead of the frosty tubes of beer their drink yesterday afternoon. Conversations were a mixture of regret and anticipation; regret from excess of those frosty tubes last night and anticipation for the day in front of them and how the night before might affect them on their rally today. In the shower block there were about ten of the rally guys in racing jackets with appropriate racing slogans on their t-shirts at every stage of their morning ablutions. These boys were all huge not only with big bellies but physically big framed with a lot of bulk. I wondered if this was a result of all the beer, steak and chips that appeared required to run a rally event, mixed with the very little physical activity required to take part in such an event. Such were the conversations that were going on in the shower block as I found an empty shower cubicle and pushed the pastel green door open into the little cream shower room. Divided into two the cubicle had a changing part at the front and the shower at the back, the changing cubicle had a wooden bench running on the right side, the whole thing was clean but very well worn by thousands of previous happy campers. Further down the block coming from the toilets I heard a guy doing a deep hack, the sound of forcing up phlegm in the extreme, the loudness of his lung clearance became the only noise you could hear in the block apart from the background rhythm of the showers drumming on bodies and the floor. Showers completed we packed up our campsite and were on the road by 9 am, our rally friends were all gone by the time we left. Down the Birdsville track the landscape appeared more desolate than it was coming in. We drove hundreds of kilometres in an endless wasteland of red rocks and the occasional scrubby bush. We stopped on a number of occasions to take pictures of the nothingness. When you have such endless countryside as this anything starts to become an attraction. Everything on the side of the road is an attraction, leading us to stop several times, one of stops a marker just propped up by a small pile of rocks, marked the spot where Charles Sturt had once passed, many years before. The wind was back, but not as strong as yesterday, although just as cold and of course our now very familiar old mates the flies were everywhere. We met the rally cars not too far out of Birdsville, heading back to Birdsville, recalling a conversation I heard later it appears they had done a special stage around Birdsville. The road was largely empty with only a few cars in any direction. Because of the cold, the wind and the flys we decided to stop at Mungerannie, a midway point for a pie and a beer for lunch. 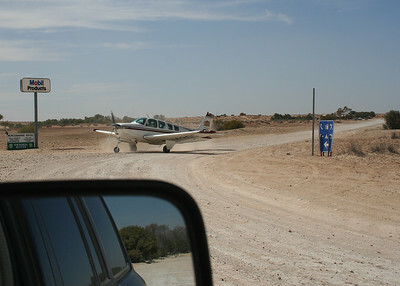 The first sight of Mungerannie was of the airstrip runway, this appeared to end right at the track. Commenting on how you have to watch for aircraft taking off, we missed the road to the pub and petrol stop. 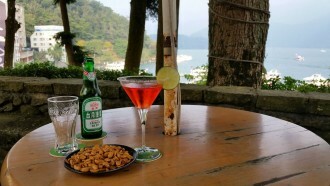 That’s right the hotel was the accommodation, the restaurant and petrol station all rolled into one. Give way to aeroplanes – Near Miss? We stopped and did a u-turn to get back to the pub, and as we headed back along the track to the turn-off another vehicle came out of the pub exit. It was a flying vehicle, a plane that is. Yes coming out of the Mungerannie hotel car park was an eight to ten seater single engine light aircraft. It’s white wings spread across the entire width of the driveway. It turned right onto the road back towards Birdsville and hopefully the airstrip. It did occur to us that if a car came down the track at the same time they were going to get a real fright as they came around the corner to an aircraft coming the other way. Sure enough, as the discussion was being had in our car, a much stranger conversation must have been taking place in a car that was heading straight towards us and the plane. We tried to get photos of what would have been great saleable pictures of an aircraft and a four wheel drive colliding head-on on the Birdsville track, but unfortunately the driver of the four wheel drive had quick reactions and pulled off as the plane passed by unharmed. I wonder in aircraft language if that is considered a near miss? We pulled in to the pub at Mungerannie and filled the Nissan with petrol. I wandered in to pay, expecting a separate counter or room or something to conduct the petrol business. I asked a desert-weathered guy with a long grey beard, an akubra and a cigarette in his hand where I paid for the petrol. 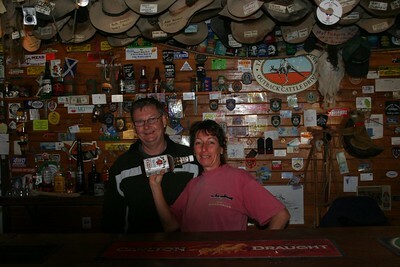 Mungerannie Hotel: Payment for taking photos inside the pub – having our picture taken behind the bar! “Okay thanks”, I said and went and stood at the empty counter. There was no sign of activity at the back, no bell to ring and three older couples in the bar were chatting to the guy who had pointed me to the counter. I stood and listened to the laughing and discussions for a few minutes and was just starting to feel abandoned when the guy with the beard and the hat appeared in front of me behind the counter. Mungerannie is a hot springs and wetlands area. We never explored these, lack of time once again, but made a pact to come back and look next time around. 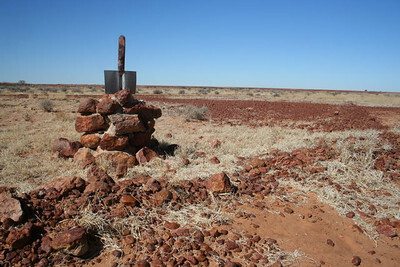 Once leaving Mungerannie we headed on towards Marree where we would pick up the Oodnadatta Track and head further west. 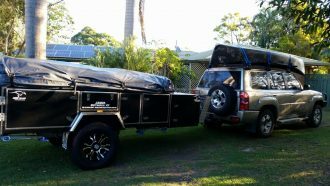 Around three thirty we came across the Clayton Wetlands, a very basic privately owned camp ground. This was a dry dusty piece of desert with a few trees and a set of well maintained clean toilets, a shower and a hot tub. Fed by an artesian spring the hot tub has a full set of instructions for it posted in the toilets. All this for nothing more than a donation on leaving. There’s a track leading down to the wetlands, about two and half kilometres away. We didn’t go and investigate as it was almost dark. Cooking dinner as the light faded into night, we heard a scurrying and a scratching going on outside. We hunted around with the torches and saw some little creatures that at first glance we thought were mice, but they were a little bigger than mice and hopped away. Intriguing we made a note to follow up later.